She said Ethernet will help employees with Skype and virtual counseling, and will extend to all of the agency’s field offices. Roat said she had been “laser-focused” on her chief goals for 2017, which were to stabilize and modernize. She has also instituted an enterprise approach and introduced advanced threat protection capabilities. As her agency migrates to the cloud, Roat has increased training sessions and performance management metrics. She hosts offsite sessions, monthly IT forums, and “lunch and learns” covering topics from cybersecurity to agile methodologies. SBA has a history of fraught IT modernization initiatives. The agency has had eight CIOs since 2005. A Government Accountability Office report from 2015 maintained that SBA had not prioritized IT transformation or conducted regular reviews. Roat joined SBA in October 2016. 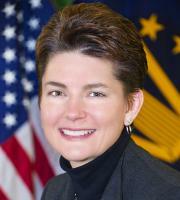 Prior to this role, she served as chief technology officer of the Department of Transportation. She also worked at the Department of Homeland Security for 10 years and served in the Navy for more than 20 years. Over the next 12-18 months, Roat said IT capabilities will continue to mature at SBA. Her long-term goal is to use direct hiring authority to expand her workforce and include more bright IT people. According to Roat, the Federal government attracts people who are passionate about the agency’s mission. For example, some employees’ parents ran small businesses.